When you go to game controllers in control panel, do you see a Playstation 3 controller, or an Xbox 360 controller? That's a good sign, the DS3 shouldn't be showing up as itself, it should be showing up as an Xbox 360 controller. Also yeah, answer Blyss Sarania's question. If you did everything correctly you should be seeing an Xbox 360 controller under Devices and Printers. Have you tried using a different USB cable? Maybe the one you're using is a charge-only cable or something. In device manager, if things are working right, under "Universal Serial Bus Devices" you should have "USB DS3 device"
Actually that doesn't show up for me. For me I see the 'Xbox 360 Peripherals' come up when I start SCPService by plugging in/turning on a controller. Maybe it's because we're running different versions? Are you talking about Device Manager or Devices and Printers? 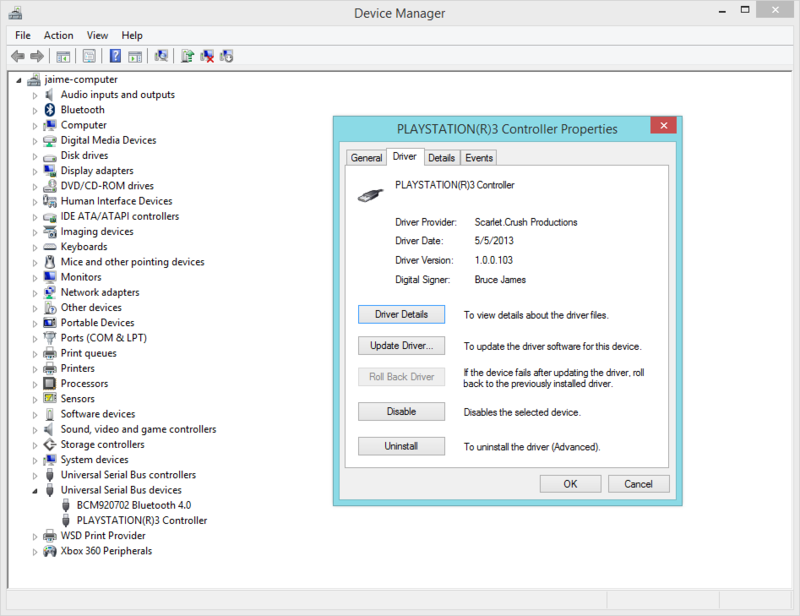 Your DS3 should not be showing up under Device and Printers, only the Xbox 360 controller. It sounds like you installed SCP correctly but for some reason it's not wanting to wrap your DS3 controller. Did you have MiJ installed before? Better DS3 Tool or something? Maybe it's cuz you are on 8. I don't know.